Michael February and Dale Staples started their respective 2016 campaigns on the World Surf League (WSL) Qualifying Series (QS) with confident performances earlier today (Wednesday) when they both advanced to Round 3 of the Maitland and Port Stephens Toyota Pro, a QS6,000 rated event at Merewether Beach that is part of Surfest Newcastle in Australia. Competing in one metre waves and in their first outings of the season, both surfers won their opening encounters on Tuesday, with February repeating that in Round 2 while Staples finished runner-up in his second heat today. February earned scores of 7.60 and 7.93 (both out of 10) that left highly rated Brazilian Deivid Silva needing an excellent 8.53 for the heat win as the pair eliminated 2015 Samsung Galaxy Championship Tour (CT) member Ricardo Christie (NZL) and Jose Ferreira (PRT) from the event. The 22 year-old from Kommetjie ended the 2015 season No. 90 on the QS rankings, which will give him a start in all the highest rated QS events for the first half of 2016, and is determined to get closer to the Top 10 (who qualify for the elite CT the following year) this season. Staples (St Francis Bay), 25, posted a 7.17, the highest score of his heat, but only added a 4.87 that saw him finish second behind Hizunome Bettero (BRA) as they ousted Adam Melling (AUS) and Reo Inaba (JAP). Dylan Lightfoot (Jeffreys Bay) and David van Zyl (Glenashley), the two other South Africans who were seeded directly into the event, were sidelined after finishing outside the top two places in their respective Round 1 heats on Monday. Matt McGillivray, who has been the top South African performer in the first four QS1,000 rated events in Australia this year and was No. 35 on the QS rankings heading into Newcastle, suffered the same fate in Round 1 on Monday. The Jeffreys Bay based teenager, in his rookie year on the QS, produced stellar performances at Newcastle on Sunday when he advanced through five cutthroat rounds to win the 48-man Trials event and earn a spot in the Maitland and Port Stephens Toyota Pro. Emma Smith, the only South African in the QS6, 000 Taggart Women’s Pro in Newcastle, was also a Round 1 casualty. See the full results at www.worldsurfleague.com or on the WSL App and watch the action live starting around 12 midnight SA time daily until Sunday. WAIMEA BAY, Oahu/Hawaii (Monday, February 8, 2016) – The Quiksilver in Memory of Eddie Aikau, a World Surf League Specialty Event, has been called ON for Wednesday, February 10 at the world-renowned Waimea Bay. This will be the ninth time this prestigious event has run in its storied, 31-year history. The best big wave surfers will take on the 20-foot-plus (Hawaiian) swell as organisers anticipate a solid day of surf that will meet the event’s strict wave face height requirement of 40 feet, with favourable light winds in the morning, turning light trades by afternoon. Durban’s Grant ‘Twiggy’ Baker is jetting to Hawaii after receiving the call up on Sunday. An invitee for the past eight years, he is the only South African to have competed in the event (2009) and is again the only one from this country in the elite 28 man invitational field this year. The 42 year-old who recently became a father for the first time, returned to the country three weeks ago to rehabilitate a nagging back injury after charging the massive El Nino swells in California, Mexico and Hawaii during December and January where he competed in the Big Wave Tour event at Jaws on the island of Maui. 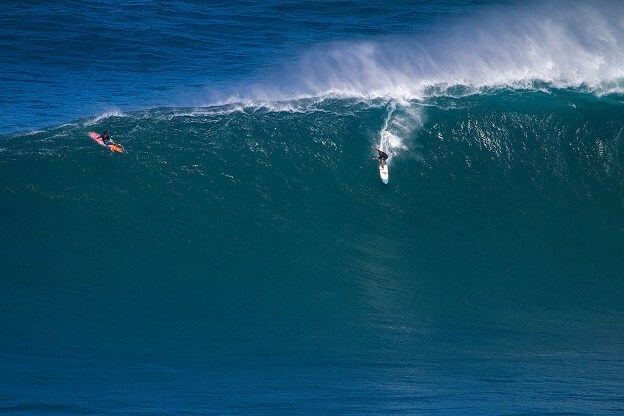 However, the lure of joining the world’s best exponents in the most prestigious big wave event on the planet was strong enough for Baker to pack his bags and boards and head back halfway around the world to compete at Waimea Bay. “It has taken us six years to pull the trigger, but this is the first swell we have seen that is truly lining up as an Eddie swell,” said Event Director Glen Moncata. Moncata and the organizing team continue to confer with event patriarch George Downing, who has made the call on every event since its inception. “As George has famously said, ‘The Bay Calls the Day’ and that will be Wednesday,” added Moncata. The Eddie will be contested by 28 invitees, including BWT current rankings’ leader and 2009 Eddie winner Greg Long (USA); Clyde Aikau (HAW), Eddie’s brother and winner of the second Eddie event; and 11-time World Champion and 2001/2002 Eddie winner Kelly Slater (USA). Baker will be up against Slater and experienced Hawaiian Dave Wassel in both his heats, along with four other competitors. The format sees everyone in the field compete twice with their best four rides from the two heats totalled to determine the winner. This makes the event difficult to run as it is imperative that the wave faces remain in the13 metre plus range throughout the day so competitors in all the heats, from the first to the last, have an equal opportunity to impress the judges. This WSL Specialty Big-Wave event is named for native Hawaiian, champion big wave surfer and life-saving Waimea Bay lifeguard, Eddie Aikau. The event honours Aikau’s legendary courage. The Quiksilver in Memory of Eddie Aikau will be webcast LIVE at WorldSurfLeague.com as well as the WSL app starting at approximately 8pm South African time. The event will be carried by our LIVE broadcast partners Fox Sports Australia, CNS Sports in the United States, ESPN Brazil, Globosat, Edgesport, Sky NZ, Sport TV, Canal + Deportes, Channel Nine, MCS, and Starhub. The mission of the WSL is simple: to inspire positive change for surfing, our fans and the environment. Formerly the Association of Surfing Professionals (ASP), the WSL has been championing the world’s best surfing since 1976, running global products across the Samsung Galaxy men’s and women’s Championship Tours, Big Wave Tour, Qualifying Series, Junior and Longboard Championships, as well as the WSL Big Wave Awards. The League possesses a deep appreciation for the sport’s rich heritage while promoting progression, innovation and performance at the highest levels; it strives to put the world’s best surfers on the world’s best waves. Showcasing the world’s best surfing on its digital platform at WorldSurfLeague.com, the WSL has energized an already-passionate global fan base with millions around the world tuning-in to see the likes of Kelly Slater, Filipe Toledo, Gabriel Medina, Makua Rothman, Grant “Twiggy” Baker, Greg Long, Stephanie Gilmore, John John Florence, Carissa Moore and others do battle in the most dynamic field of play in all of sports. For more information, please visit WorldSurfLeague.com.